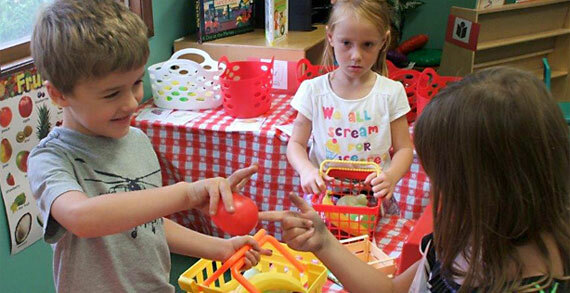 Northwest Chapel Preschool and Kindergarten offers 3-day programs for 3 year old students. We Joy Sing visits the 3 year olds every month for music enrichment. Northwest Chapel Preschool and Kindergarten also offers 4 day classes for the 4 and 5 year old students. Early bird, lunch bunch and Integrity Gymnastics are all available for the pre-k students. Looking for Kindergarten enrichment? Northwest Chapel Preschool and Kindergarten has a 5 day morning class for students who are homeschooled or attend an afternoon Kindergarten. Northwest Chapel Preschool and Kindergarten also provides early bird, lunch bunch, Integrity Gymnastics and afternoon transportation to Washington or Hoffman Trails Elementary Schools. Northwest Chapel Preschool and Kindergarten follows the Hilliard City School Schedule. Northwest Chapel Preschool and Kindergarten has a convenient drop off car pool line and provide Chapel for its students to embrace Christian values. Northwest Chapel Preschool and Kindergarten's classes provide rich environments where children are encouraged to explore and are challenged to learn, while making friends and developing self-confidence. The intent is to provide each child a strong foundation and equip each child to successfully transition into the next level of education. The program has an experienced, loving, and caring staff ready to serve you and your child. Northwest Chapel Preschool and Kindergarten not only prepares the young child academically, but they also give them a foundation for spiritual growth by providing daily Bible exposure and monthly interactive Chapel programs. Northwest Chapel Preschool and Kindergarten invites you and your child to come see the wonderful facility, meet the dedicated staff, and discover what makes Northwest Chapel Preschool and Kindergarten so unique.